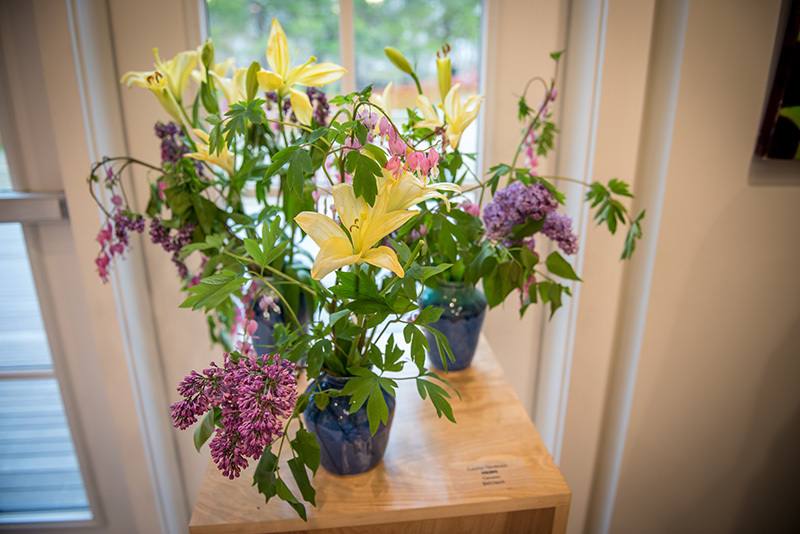 Art of Flowers exhibit brings the outdoors inside the Francine Kelly Gallery. The Featherstone staff knew that the Art of Flowers show was going to be big this year, but they had no idea how big until the first painting arrived. 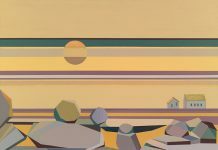 Artist George Brown, who is showing for the first time at the arts center, was the first to arrive with his contribution to the show — a 6-foot by 6½-foot painting on Masonite. 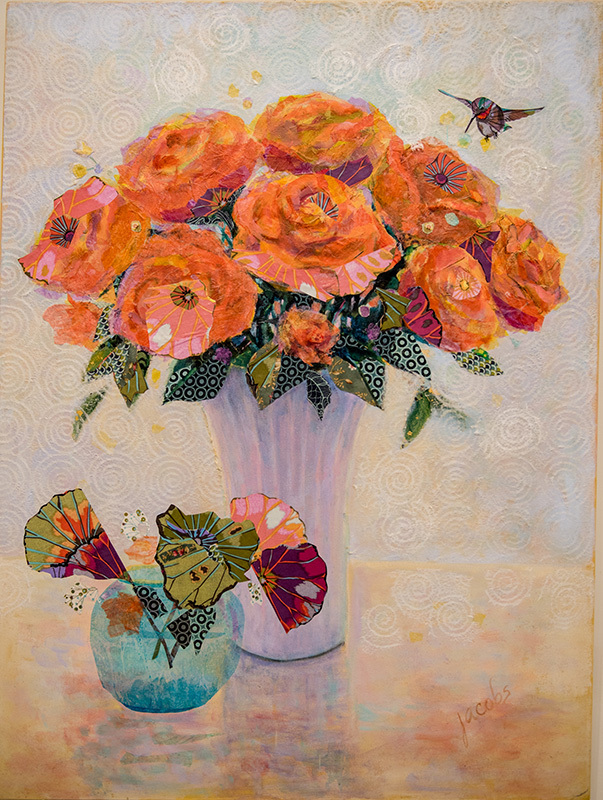 Sixty-plus other artists soon followed, including another Featherstone newcomer, Pam Dunn, whose huge painting of peonies rivals Brown’s work in size. 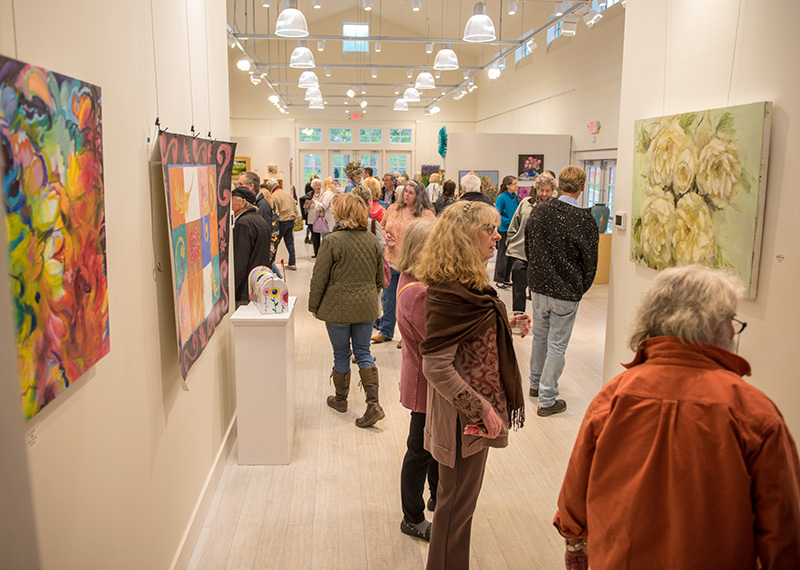 The spacious Francine Kelly Gallery, which occupies the new Art Barn, proved the perfect space to accommodate the show, which always attracts record numbers of participants. The space is three times the size of Featherstone’s Virginia Weston Besse Gallery, where all of the featured exhibits were previously hung. “It seems like another rebirth of the flower show, because there’s so much room,” says Holly Alaimo, who has curated the annual show since its inception, 22 years ago. 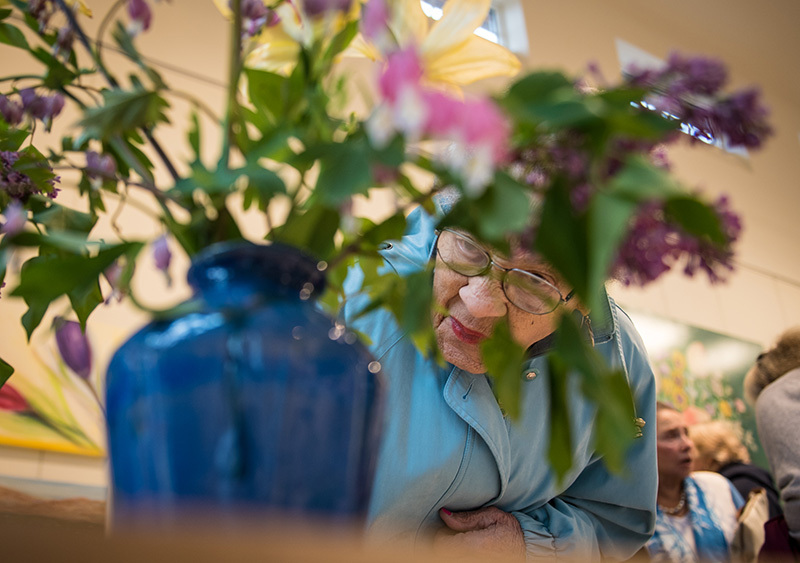 Not only is there plenty of space for the artists’ work to shine, Alaimo was also able to display her own creativity with the exhibit; she had two botanical displays installed in the middle of the large space. A variety of plants, on loan from Mahoney’s, surround two bird baths created by Scott Campbell and Frank Creney. The displays were designed by Cammie Naylor and Gabrielle Whitcombe. 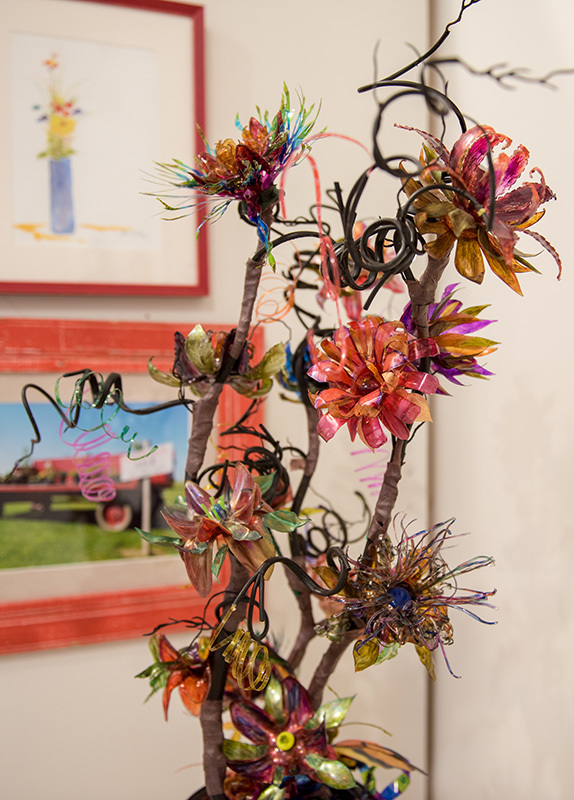 “This year I really wanted to bring some garden art into the show,” says Alaimo. The result is spectacular, adding an organic element to what is always the most colorful and spirit-lifting show of the year. 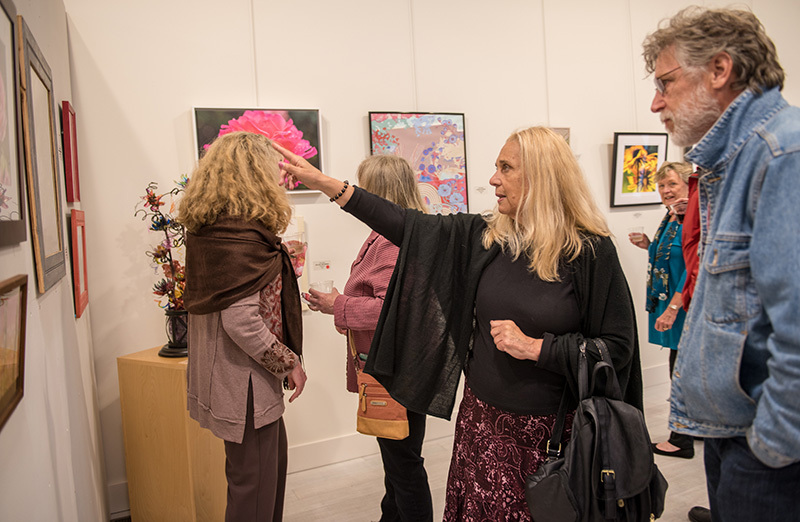 Despite the gray weather on Mother’s Day, visitors to the show’s opening stepped from the gloom of outdoors to a veritable greenhouse overflowing with flowers of every color and variety. 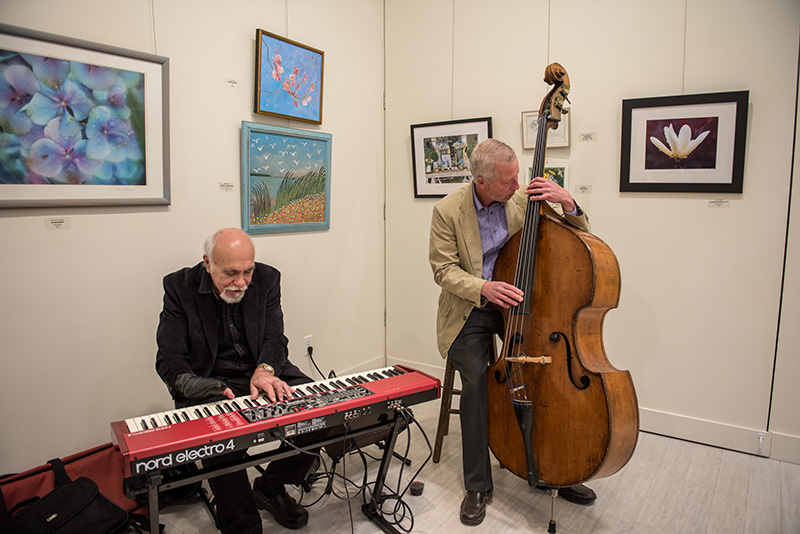 Adding to the festive mood, keyboardist John Alaimo and bass player Mike Tinus provided music while the refreshments included floral fruit bouquets by Amy Custis. 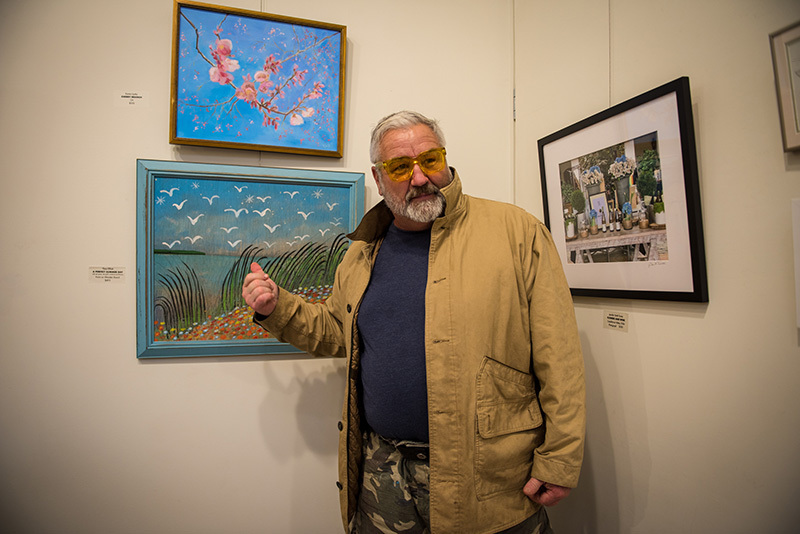 Among the dozens of participating artists are newcomers to Featherstone, painters Frank Gentile and Sabrina Raymond and photographers Wendy Palmer and Irene Ziebarth. 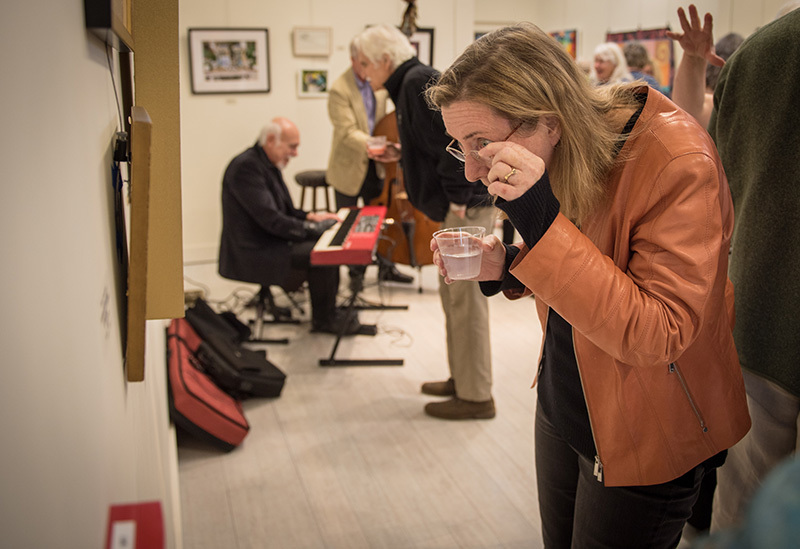 Dozens of other local artists added their own unique visions, interpreting the theme in paintings, photos, collage, ceramics, and more. A floral bouquet made from recycled soda bottles by Gael Costigan is a good example of the ingenuity of Vineyard artists. 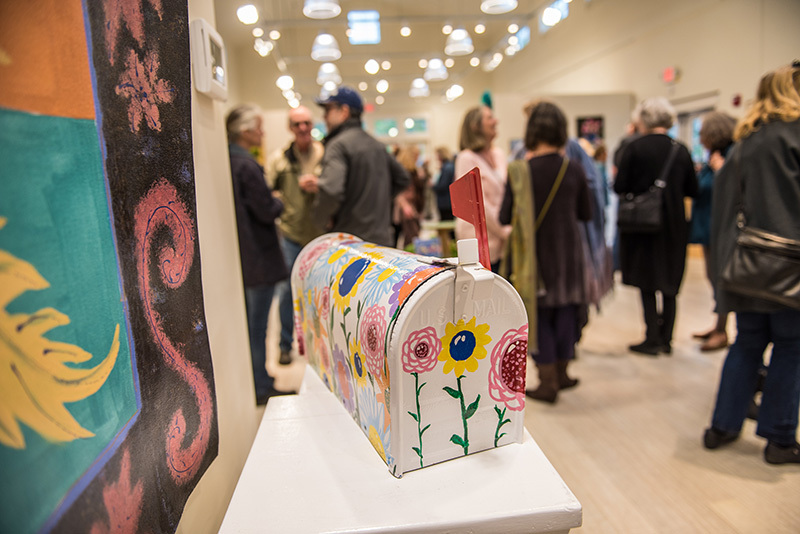 The opening also marked the launch of Featherstone’s gift shop, featuring handmade items, including jewelry by Lucinda Sheldon and Alicia Roberts, ceramics by Featherstone teachers, cards by various artists, and ponchos and scarves by Minor Knight. 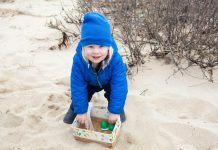 There was much more going on at the Featherstone campus on Mother’s Day. The lineup of events included the opening of the MVRHS Photography Show, featuring the work of Davin Tackabury, Tyla Packish, and Daniel Rivard, all recipients of the Boston Globe’s Scholastic Art and Writing Awards, and the dedication ceremony for the new John Schule Chapel, which was recently relocated from Edgartown to the Featherstone campus. “The chapel will provide a space for serenity and creative inspiration,” according to Smith. 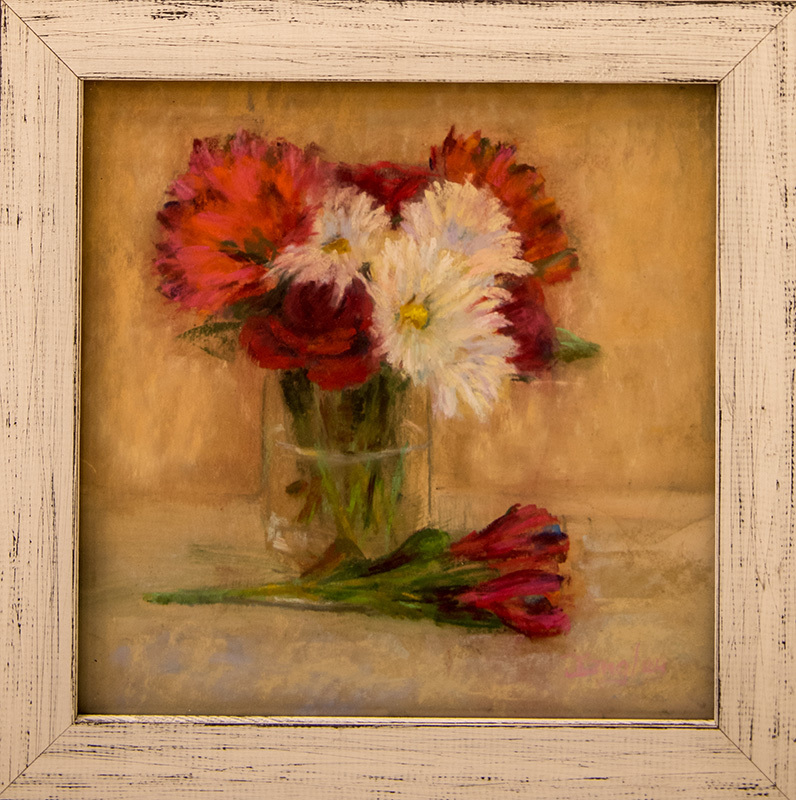 Art of Flowers Show, guest-curated by Holly Alaimo, runs through May 28. Visit featherstoneart.org for more information. 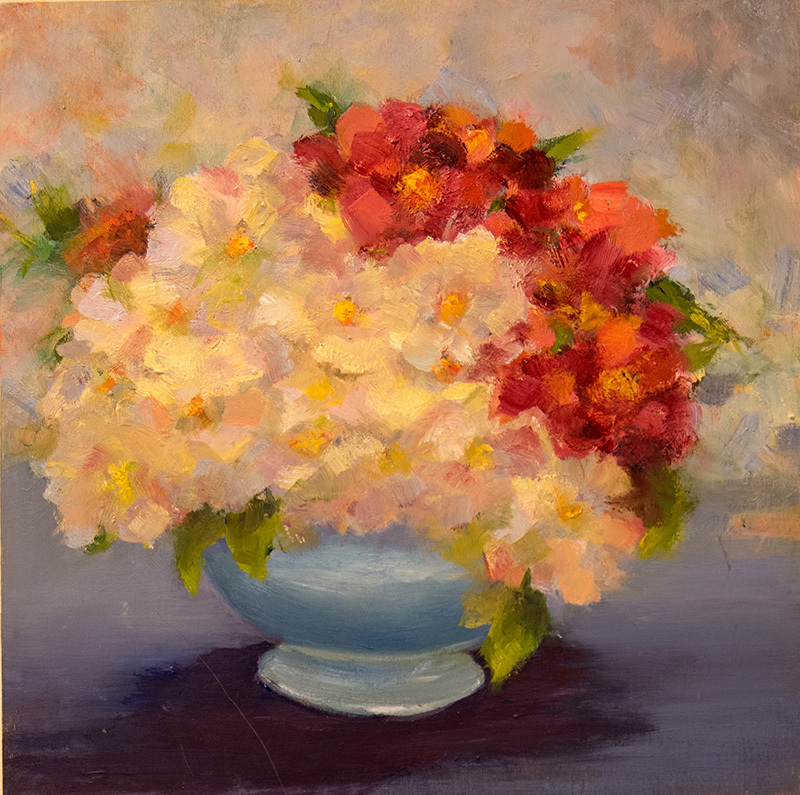 I think the large painting of peonies to which you refer might have been done by my good friend Heather Sayeau Dunn, who is a “retired” professor of art from Halifax, Nova Scotia, now married to an Edgartown man. Or there was another painting of peonies which I may have totally missed! 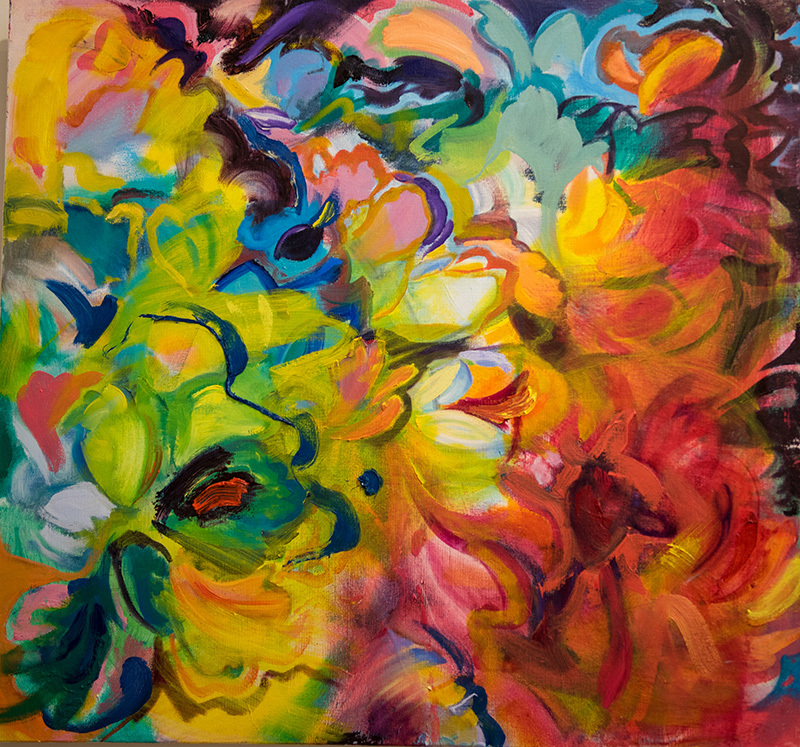 In any case, Heather’s beautiful paintings can be viewed further on her own website.